What an excellent time to have fun and preserve memories. This year we celebrated our family in a very big way at a cemetery of all places. On a gorgeous Saturday morning we had a mini-african drumming session where we called out the names of our slave ancestors and all of their children and dedicated a headstone to our patriarch. To top it all off the local newspaper shared our inspiring story with the community with a front page feature story. What a blessing. We captured this event on video, digital photos, camera phone photos, cassette tape audio recording and through the print media...what a day. Kwanzaa Can Be For EVERYONE! Although it's a weeklong celebration in the African-American community, everyone can reflect on the principles during December 26 - January 1and apply them to your own life. For more ideas, check out Lisa Sanford's BLOG, or the ideas in Ethnic Scrapbooking. Chris Rock's movie Good Hair is a great example of Ethnic Scrapbooking. Many women of all races come to me and ask me how to scrapbook their hair journey. Some just want to create a compilation of their various hairstyles, some want to make business portfolios, others want to scrapbook their journey as a form of therapy showcasing how they have come to grips with their hair. Every woman can write a personal story about their hair, jot down a story or two today. Another Amazing and Glowing Review! Please check our what the ladies at SCRAP FRIENDS had to say about my book. They all said exactly what I want people to say and feel after reading my book, Ethnic Scrapbooking. Please leave a comment here and let me know what you think of their reviews. 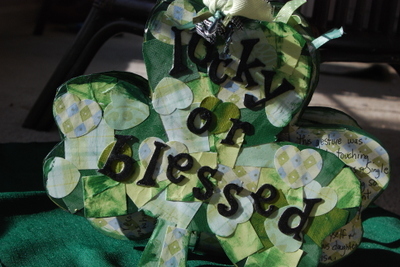 Here's a link to my blog where I feature my most recent connection to the Irish tradition of St. Patrick's Day <CLICK HERE> be sure to follow the links to the instructions and the photo album of the inside pages.